A symbol for vegetarian food and vegetarianism. Download it as a vector or bitmap image, or use it as a font icon on your web site (see below). 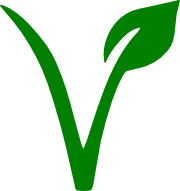 The “V with a leaf” symbol, as represented here, is a trademark of the European Vegetarian Union (EVU), who grants licences to the food industry to use this mark on their products. A symbol for vegetarian food used in India, and sometimes in other South Asian countries, as defined by the Food safety and standards (packaging and labelling) act of 2006. 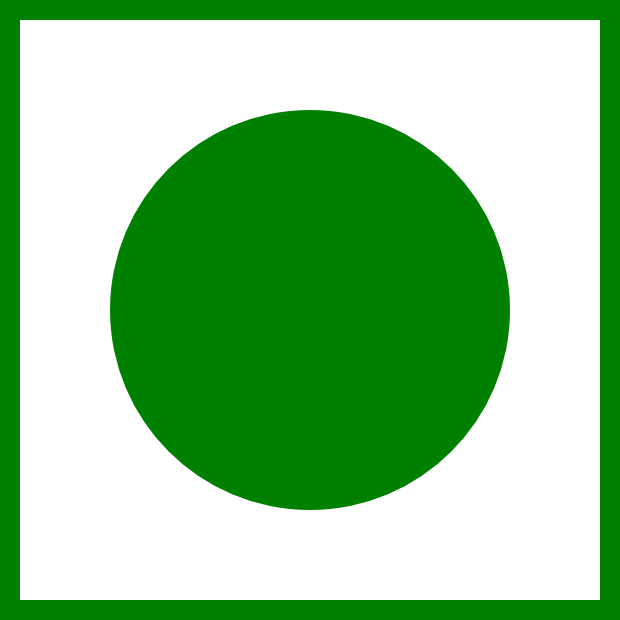 Often referred to simply as the “green dot”. See also Wikipedia. Unicode alternative: A black circle with a combining quare, ●⃞. Rendering might not be perfect in all browsers. Html code: <span style="color:green;padding:0 .3em">&#9679;&#8414;</span>. Or, semantically less accurate, but more consistent in rendering, a squared dot, ⊡. If the font for some reason fails to load, the character Ⓥ will show instead of Ⓥ. ⊡ can be used in the same way: <span class="vegetarianicon">⊡</span> gives ⊡. Unlike in the first approach, icons will not be copied if the user tries to copy and paste the text. For ⊡, use <span class="veg-indian-vegetarian"></span>. The font is created with icomoon.io. The Chinese character zhāi (斋) is sometimes used as a general vegetarian symbol, though the word for vegetarian food in Chinese is 素食 (sùshí). The unicode character Ⓥ (a circled, capital ’V’) is sometimes used to indicate vegetarian or vegan food or lifestyle. There is an hardly ever used inverted version as well, 🅥; a corresponding small letter, ⓥ; and some other variants, existing mostly for backwards compatibility with various pre Unicode character sets: ⒱, 🄥, 🅅, 🆅, 🇻. A lot of your users will not be able to display these last characters. Have you seen other interesting symbols? Send them to mail@leowallentin.se!